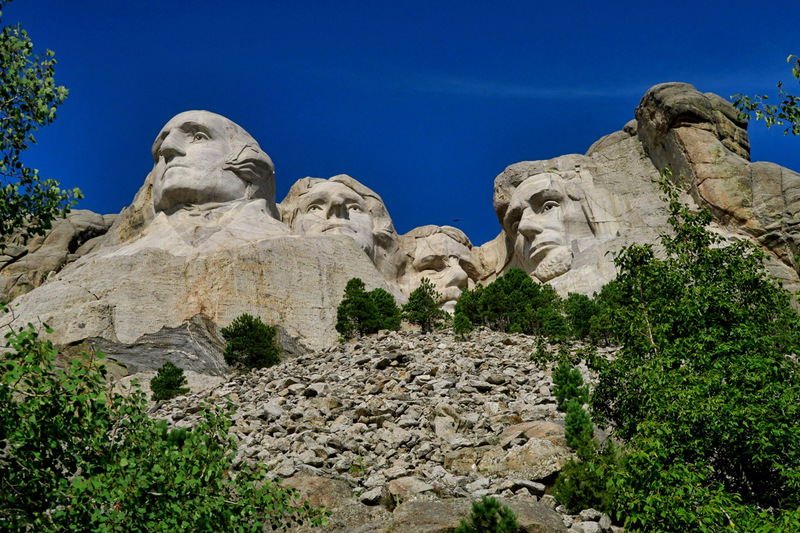 Visiting Mount Rushmore has never made an appearance on my bucket list. After living in Atlanta for eight years near Stone Mountain, seeing the sculpture designed and initiated by the same artist carved into the granite mountain, my thoughts were “Impressive feat, but I don’t need to make a special trip.” However, with two national parks within a 75 mile radius, it got bumped up the list. I must confess as blasé as I was about visiting, I was awe struck before I even reached the parking lot. There was something about seeing the massive carving appear as I crested the hill out of Keystone that left me with chill bumps. It’s just so….well….omnipresent! You can see it from the road, you can see it through the tunnels, you can see it from the hiking trails. 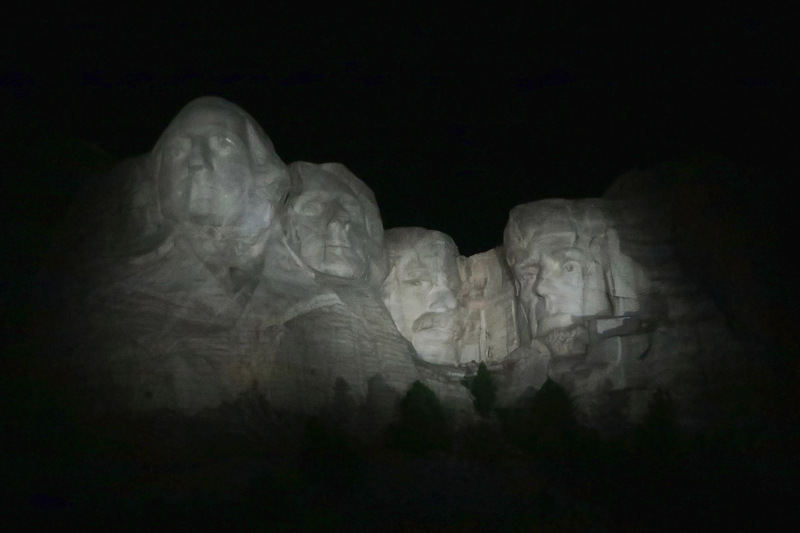 Their stone-cold gazes (pun intended) cast out over the land. The monument comes into view on approach from the town of Keystone. The entire monument complex is quite impressive. 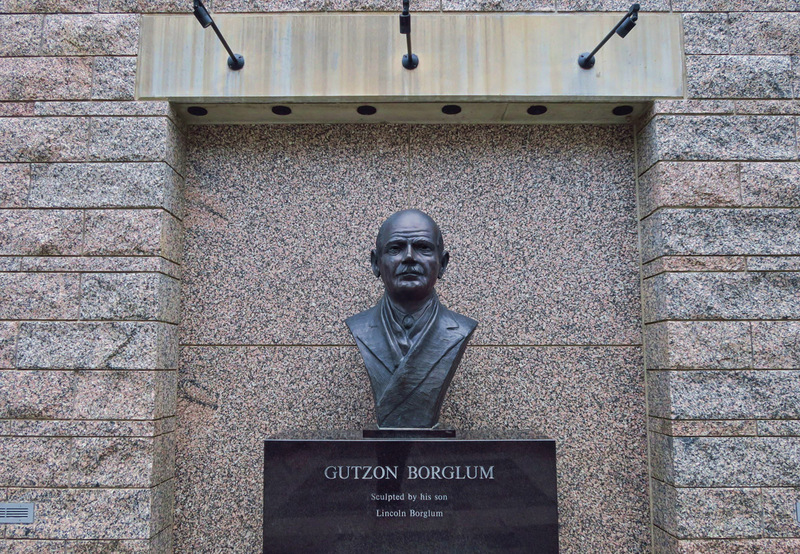 Bust of the sculptor with a storied past. Photo copy of a postcard, the only thing I could find to show what Mt. 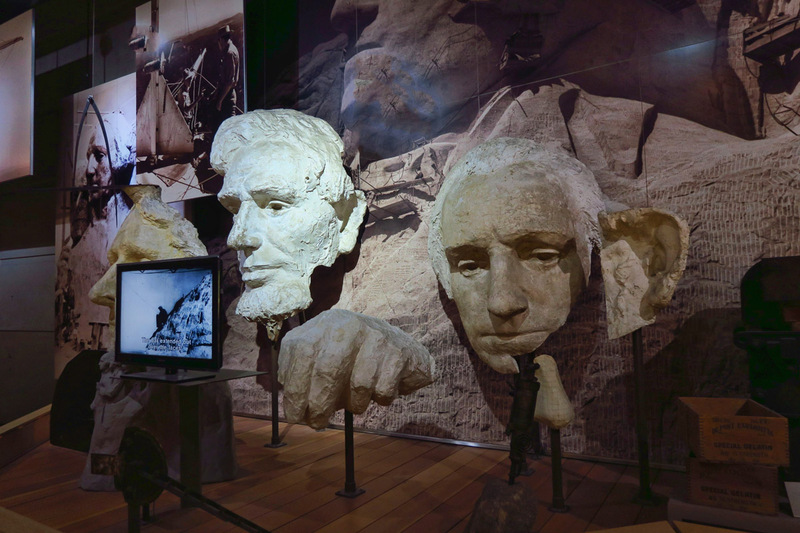 Rushmore looked like before the sculpting began. As impressive as it is from the roadside, the entrance and presentation of the national monument serves to enhance the stature. 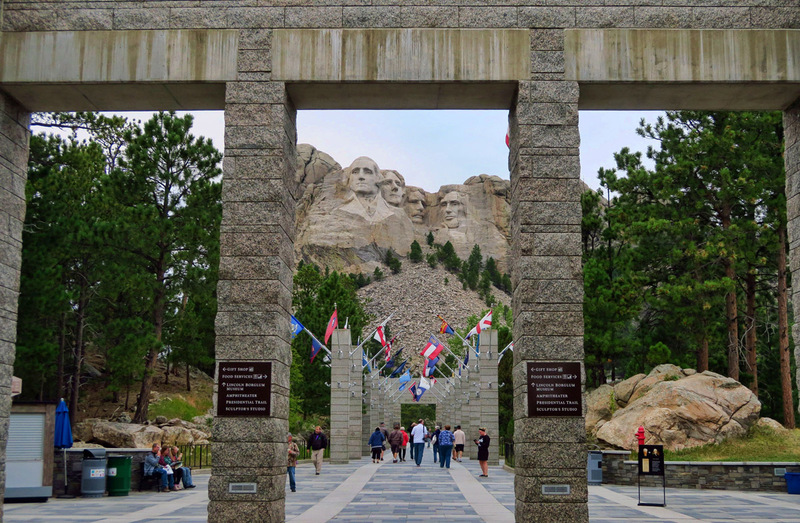 A granite-columned arcade lined with flags from all 50 states, a vast viewing platform, separate Visitor Center, bookstore, museum, and the largest gift shop I’ve seen at any NPS facility lends to its majesty. 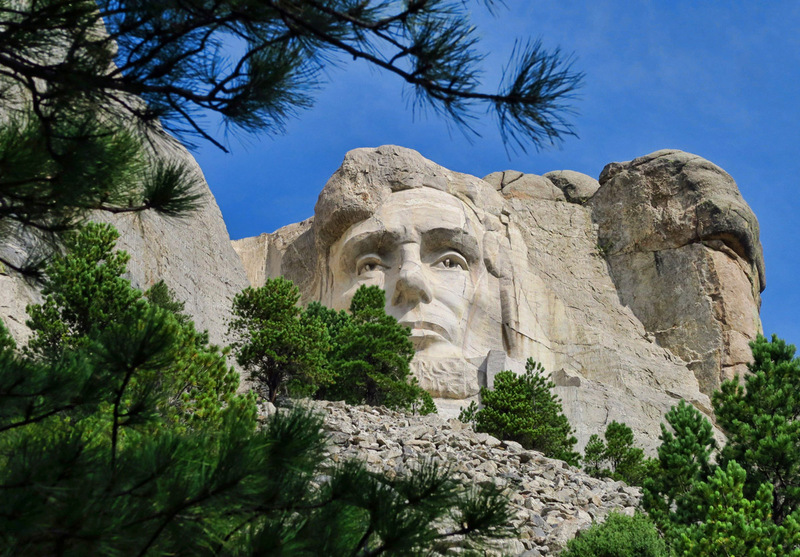 A short path, the Presidential Trail, allows visitors to get a little closer to the monument, though there are warnings of severe penalties for anyone who would think of attempting an off trail scramble. Sadly, the Sculptor’s Studio at the end of the trail was closed for renovations during the time of my visit. 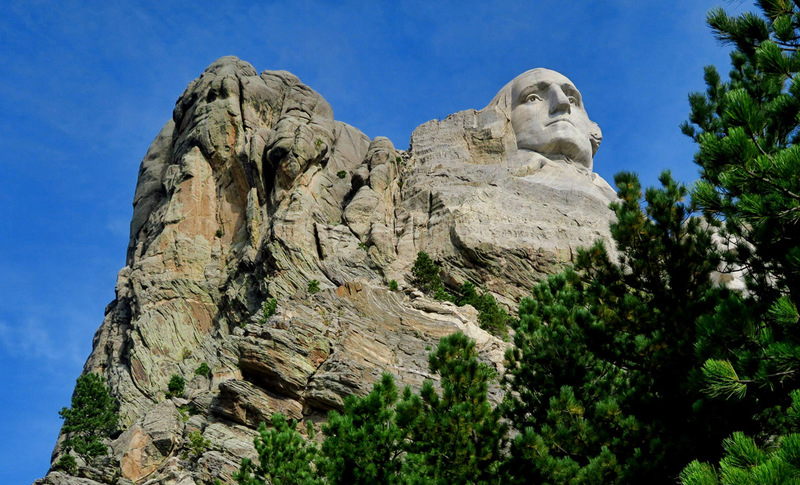 Each of the heads is 60′ tall, with 20′ noses except for Washington’s nose which is 21′ long. This view is from the Presidential Trail. It’s as close as you can get to the sculpture. I liked this angle because I could see the rim of Roosevelt’s glasses. In the museum, photos explain how the dimensions were defined on the models with a pivoting arm mounted at the top of each head. Those dimensions were then increased in scale for the larger monument using a similar pivoting arm. Ninety percent of the carving was done by dynamite, with the remaining 10% being done by chisel. There are some great displays in the museum which explain how the sculpting was achieved. 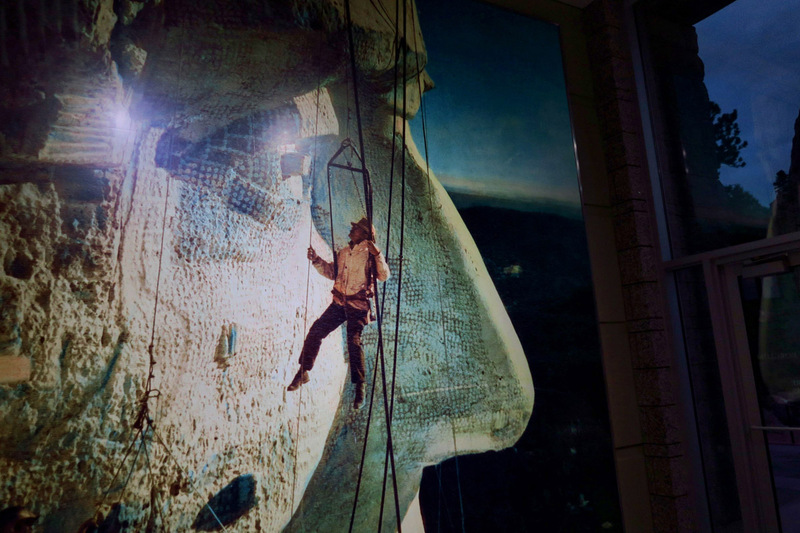 A photo of a photo of one of the workers alongside a 20 ft nose. 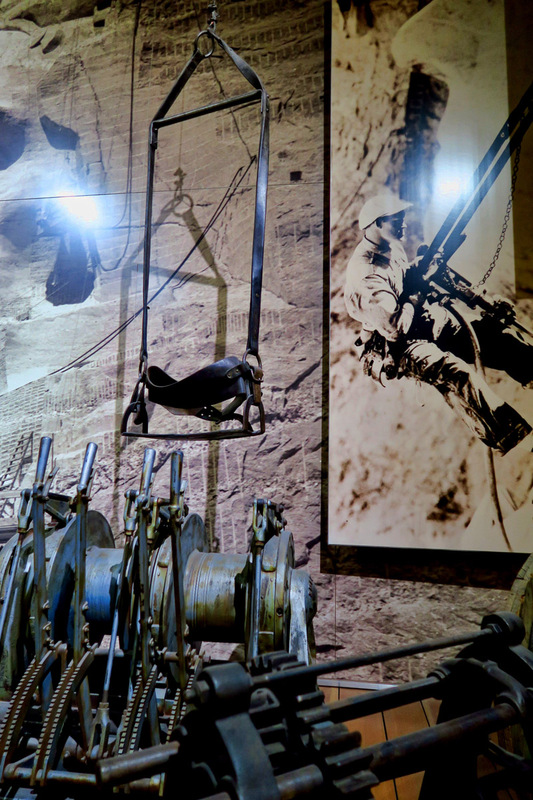 Workers hung from these swing-like chairs while they were chiseling. 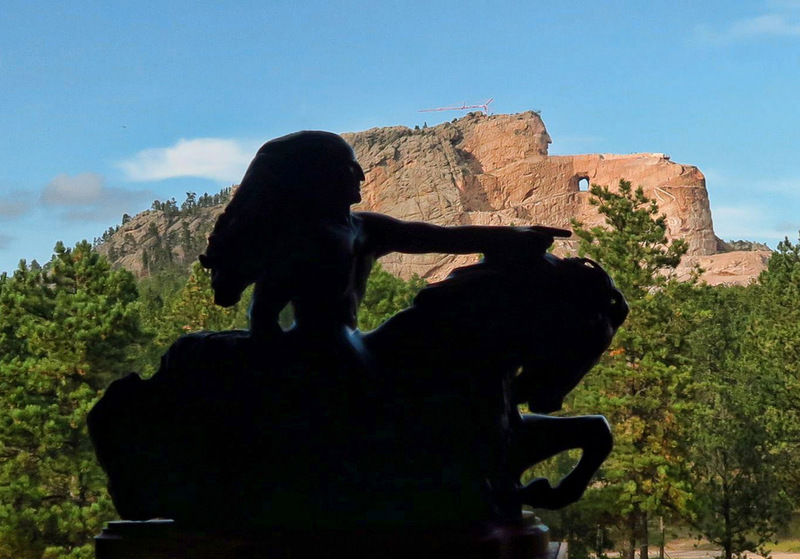 The monument originally morphed from an idea that a local historian had to carve statues of famous people from the nearby Needles, tall spindly spires of granite in the Black Hills. The Needles granite spires were deemed too unstable for carving, so they went with Mt Rushmore, named for Charles Rushmore, a New York lawyer who came here on expedition in 1885. 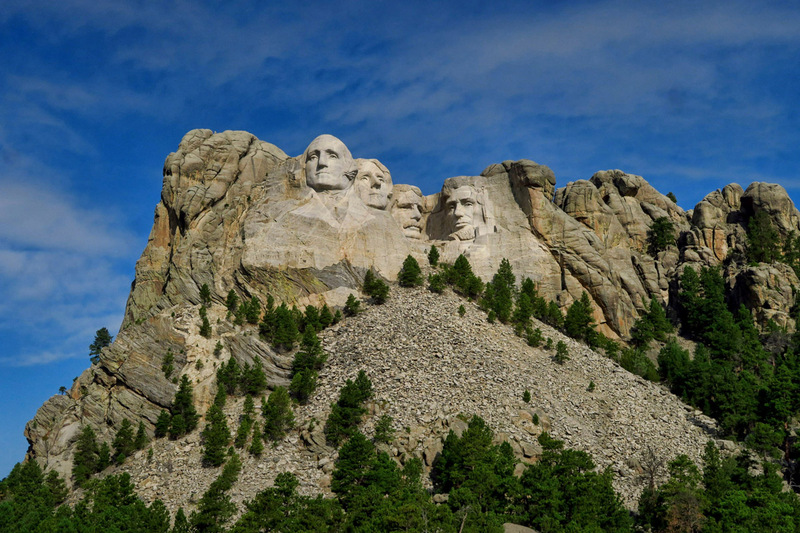 The carving began in 1927 and ended in 1941 at a cost of just under a million. 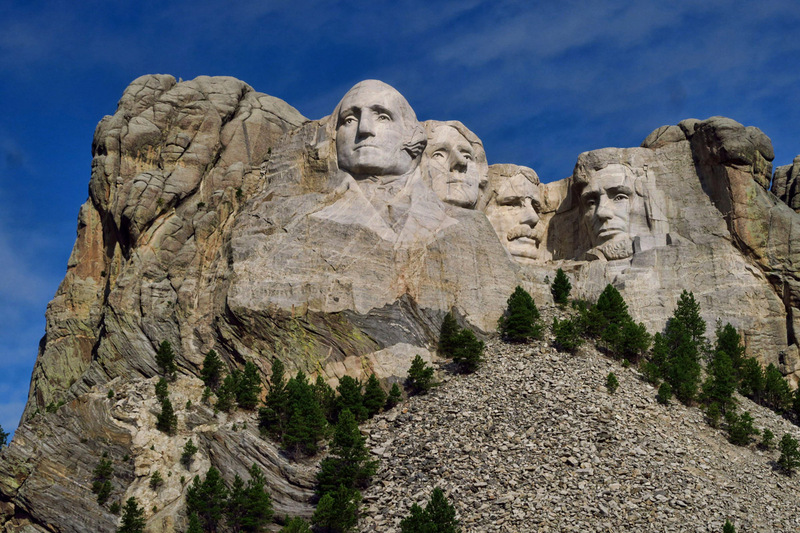 The plans originally intended for the presidents to be carved from the waist up, but lack of funding resulted in the current heads only. Around 400 workers supported the project, remarkably with zero fatalities. 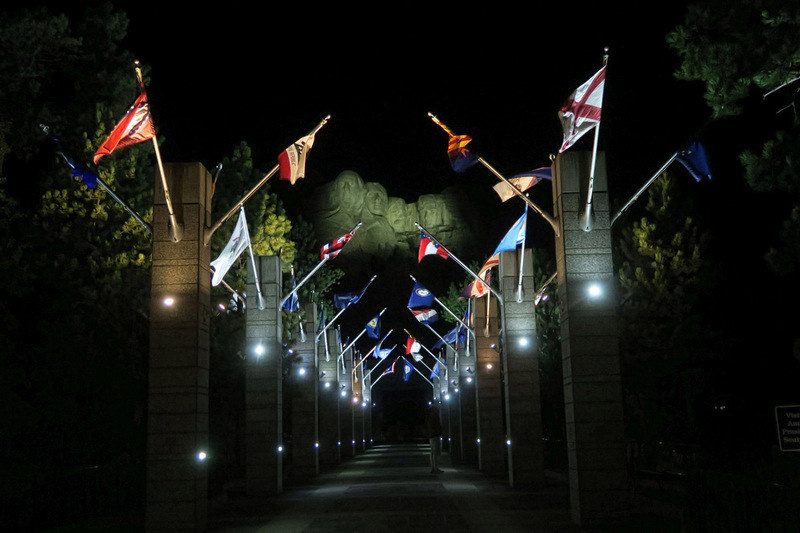 At the end of the NPS Evening Program was a lighting ceremony whereby the sculpture was illuminated by spotlights. There is no admission charge per se, only a parking pass ($5 for geezers!) that permits re-entry for a year. So I recommend returning for the evening program, but dress in layers as evenings here are chilly! 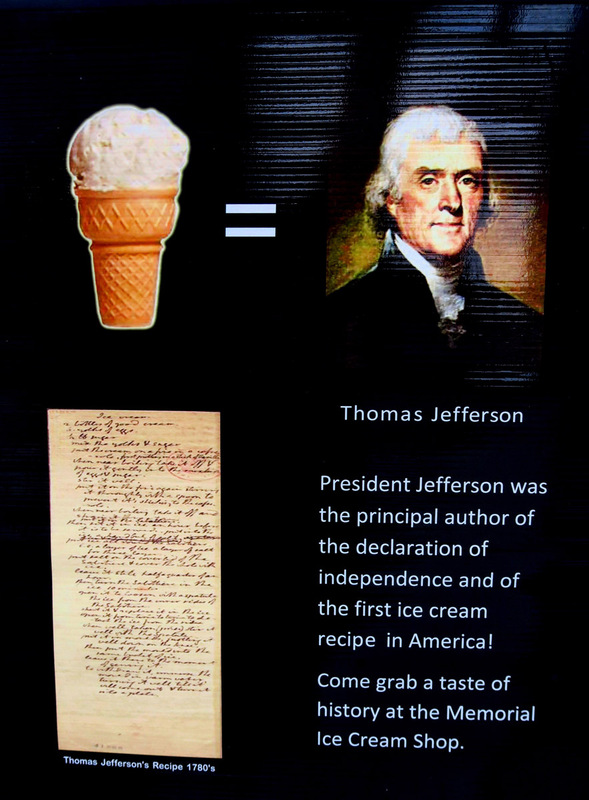 Thomas Jefferson is credited with the first ice cream recipe in America. Copies of the recipe are available in postcard form. A fellow traveler told me not to miss the ice cream, which was sound advice! 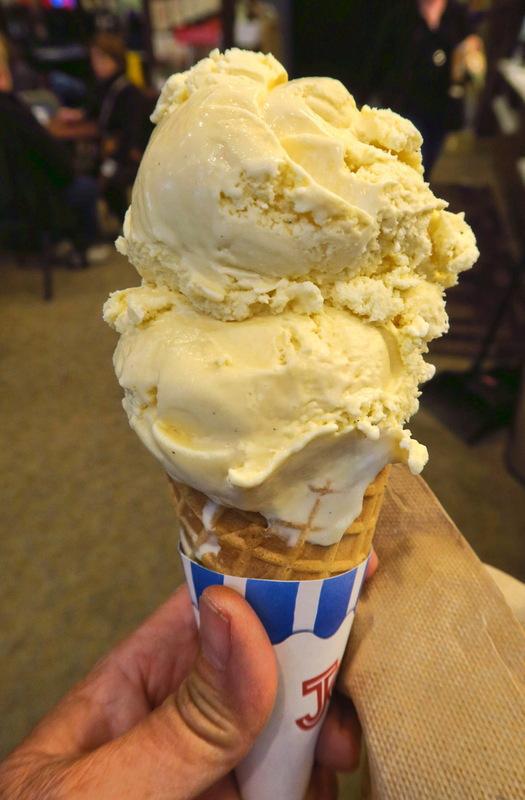 “TJ’s Vanilla” was the best vanilla ice cream I have ever purchased! An interesting tee shirt on offer at the Mt. 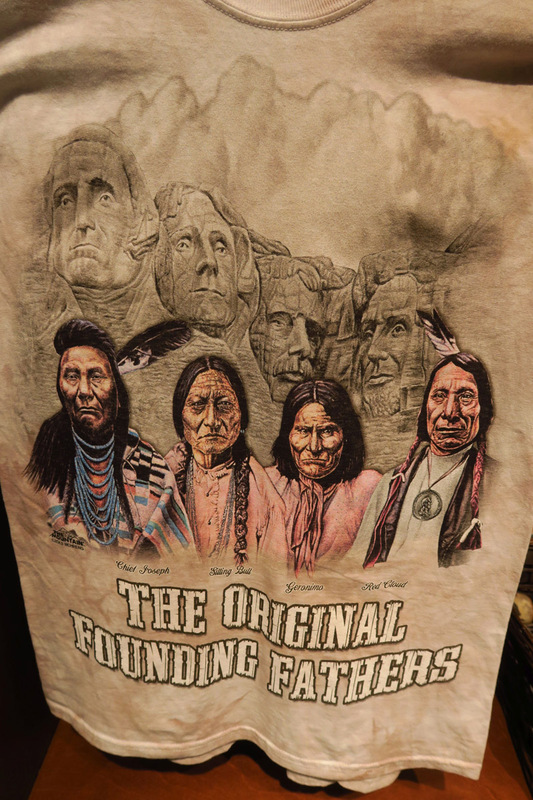 Rushmore Gift Shop, depicting the “Original Founding Fathers,” Chief Joseph, Sitting Bull, Geronimo, and Red Cloud. In the foreground of the photo is the model superimposed on the mountain being sculpted in the background. The sculpture was begun in 1948, with no date for completion. The Visitor Center complex is quite expansive and impressive. 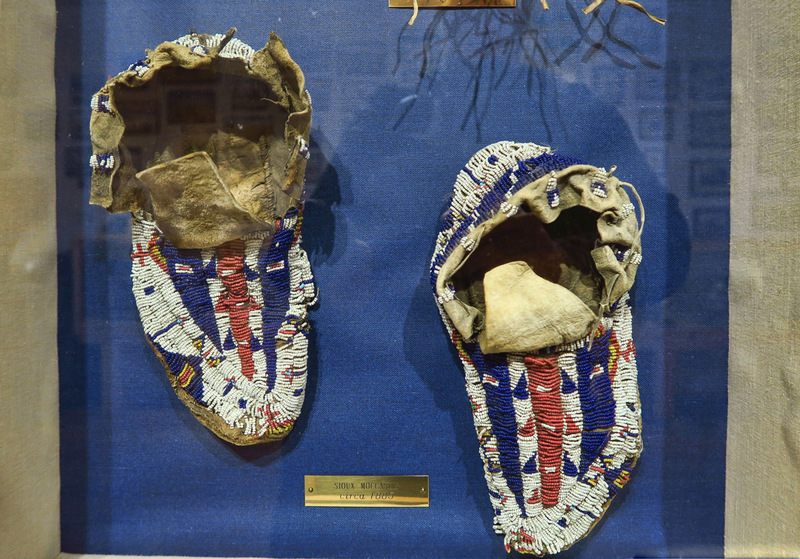 When I have toured Native American museums in the past, I am always disappointed that there are not more clothing artifacts. Not so here, there are dozens! 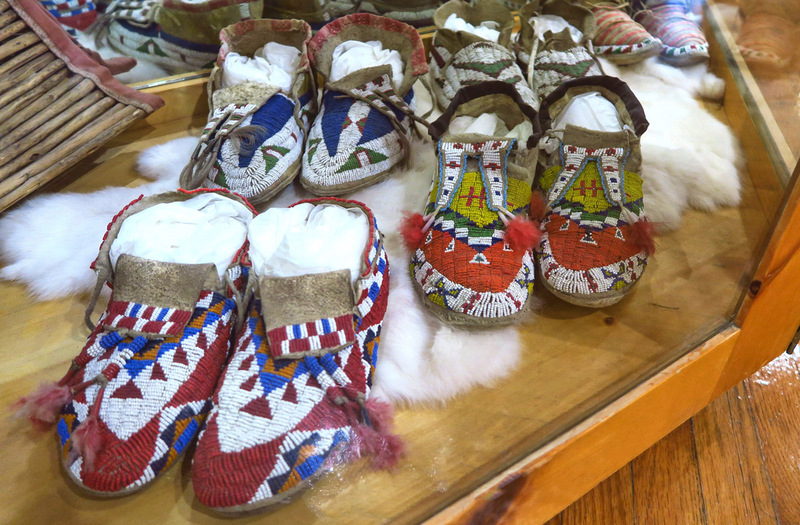 Beautiful bead-work adorns shoes, dresses, vests, shields, etc. Although it takes only minutes to view the sculpture in the distance, allow time to explore the artifacts. 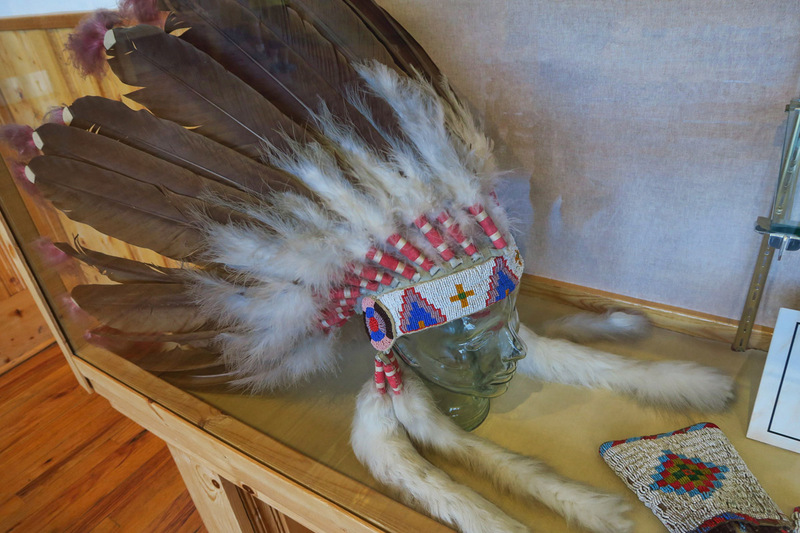 Lots of warrior headdresses on display. 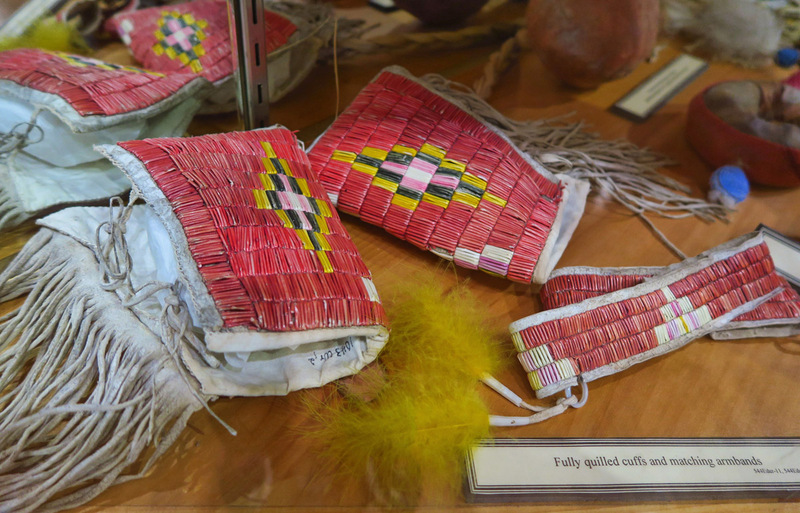 Before glass beads were readily available, they used porcupine quills to adorn their ceremonial attire. 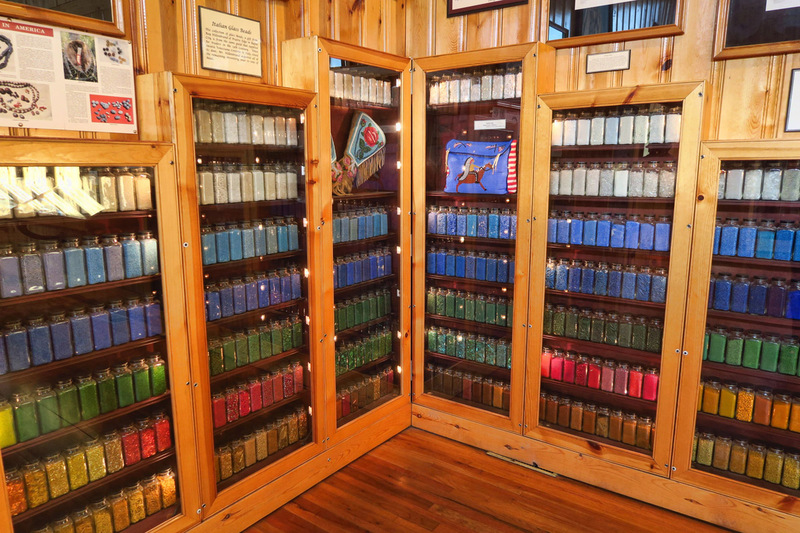 I always wondered where they got the glass beads back in the 1800’s. This question was answered in the museum. 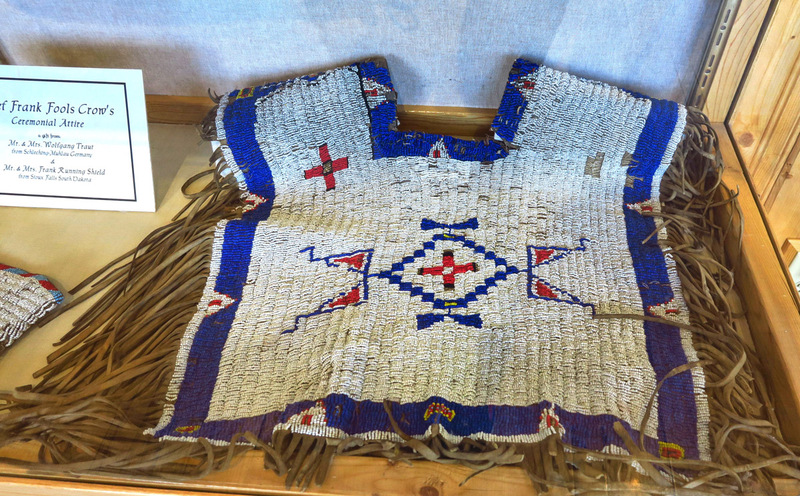 Italian fur traders brought them over as collateral to trade for furs. This display is part of a 70 ton collection that came from Societa Veneziana Conterie in Italy. 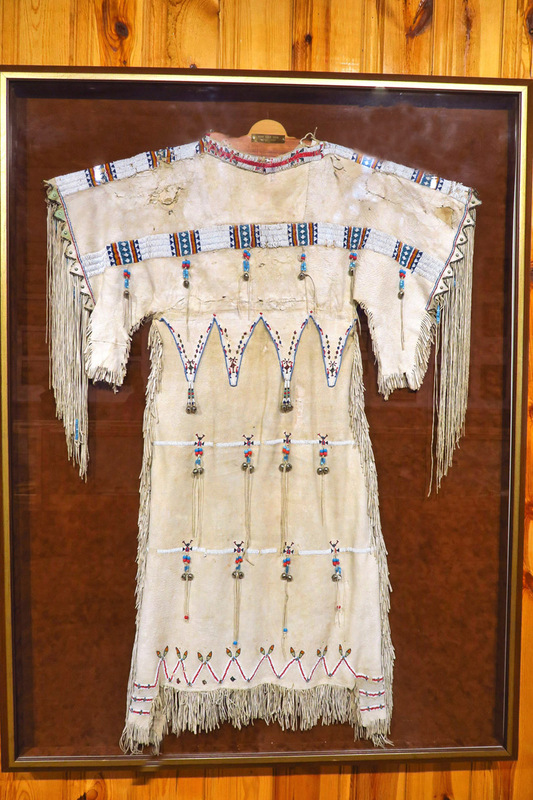 Beautiful beaded costume for the horse. 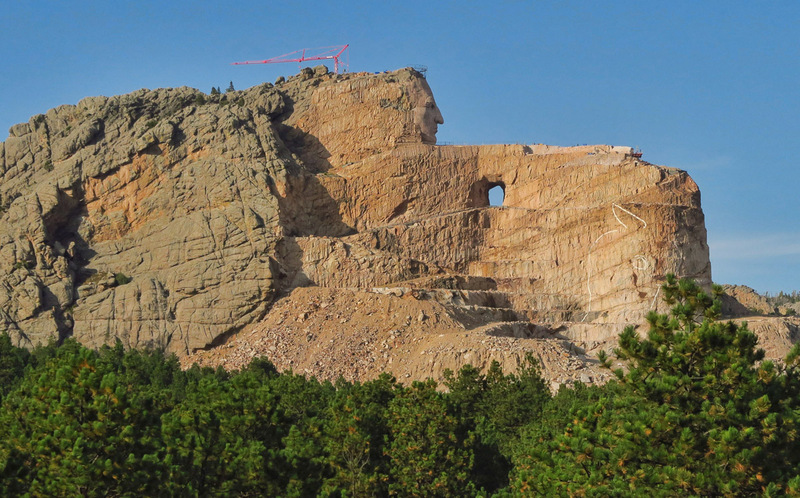 This entry was posted in South Dakota and tagged Black Hills, Crazy Horse Memorial, Mount Rushmore by Suzanne. Bookmark the permalink. Great pictures and wonderful history. Thank you! That is some interesting history on Mt. Rushmore! We drove past it about a dozen times this summer but never stopped in to take a closer look or stopping by the visitors center. 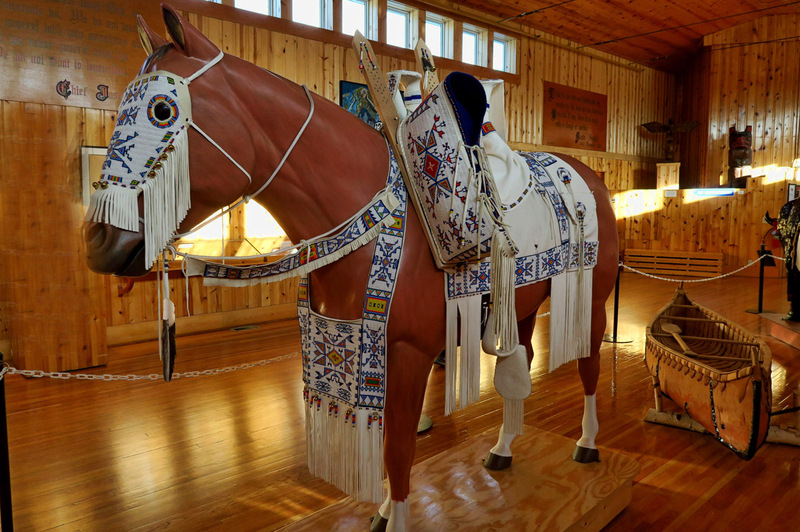 We did however, stop by Crazy Horse a handful of times and found that very interesting. Thanks for sharing! Thanks for the picture of the before postcard. I’ve always wondered what the mountain looked like before it was carved. 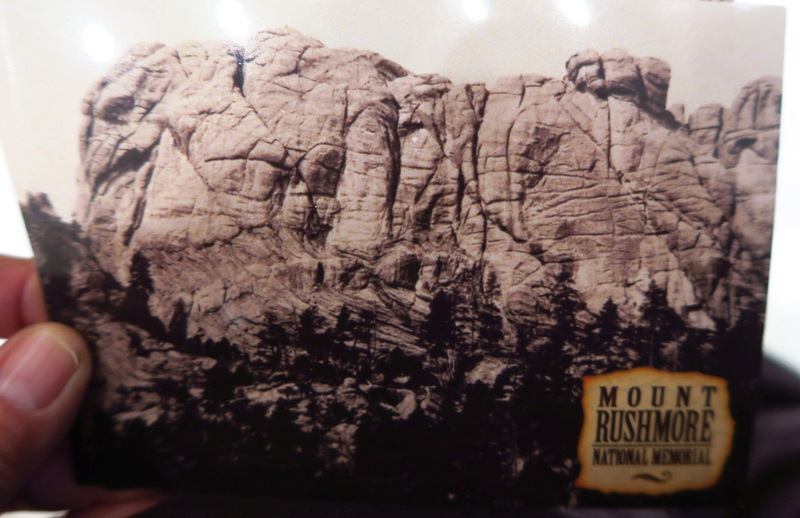 We visited the Black Hills and Mt . 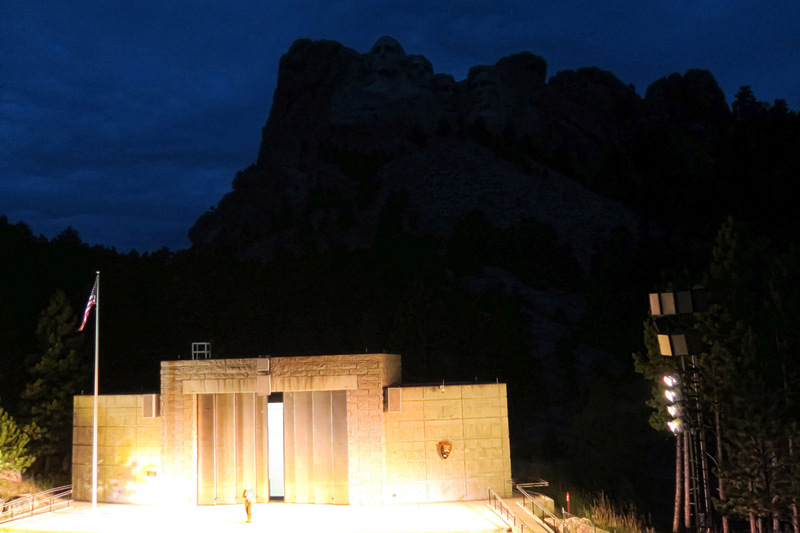 Rushmore last year and felt the same as you. It, and the facilities, were very impressive. The park service went all out on this one. The story about the artist and what was ultimately accomplished is mind-blowing. Wow! Never thought I needed to visit this place until now. It’s on my list. Thanks! I visited there in 2012. I agree with you that it’s an impressive artistic and engineering accomplishment especially when you see it up close. Also, the NPS facility showcases it very well. While driving along a couple of the approaching roads, I would get glimpses of it. And looking at it was far away I had an opposing thought. 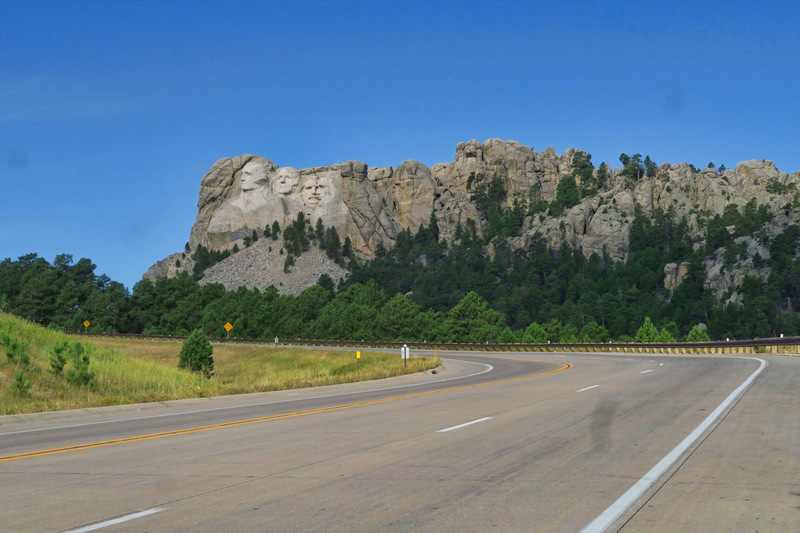 Nothing to do with the four guys depicted, but another way to see it is that it’s somewhat of a scar on the Black Hills. It was carved in another time when I guess it seemed ok to take something and carve it up. But image today if some group proposed carving John Wayne’s head into the West Mitten at Monument Valley or John McCain was to be carved into Coffee Pot Rock in Sedona or Barrack Obama was carved into Diamond Head in Oahu. OMG there’d be uprisings. 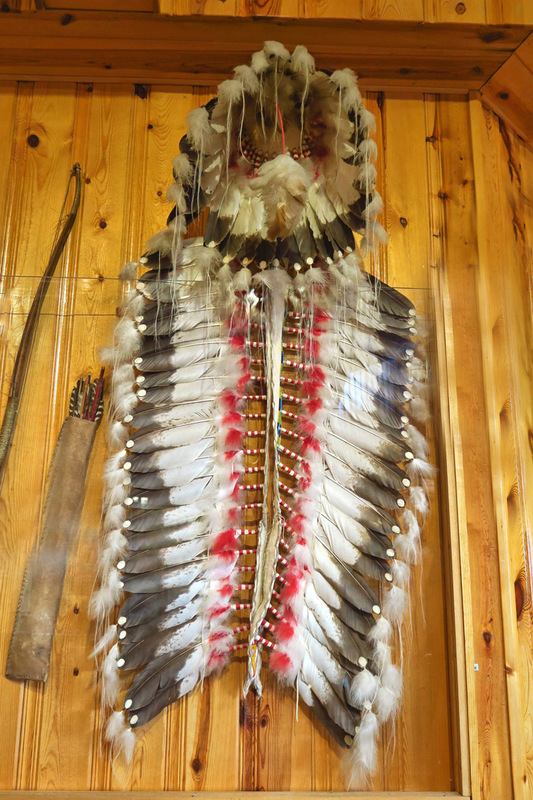 So,I also sympathize with the Lakota who don’t view Mt. Rushmore positively for a variety of reasons.